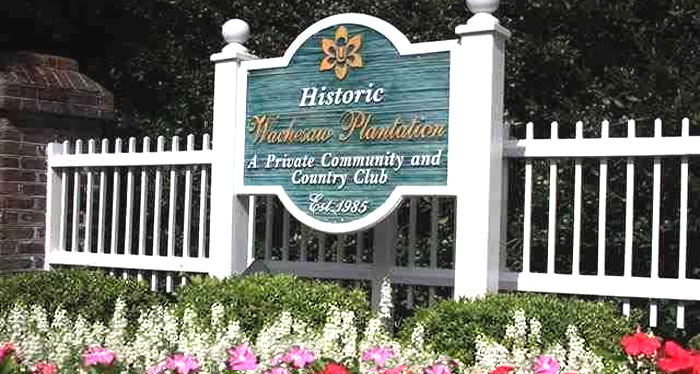 The historic village of Wachesaw Plantation was originally an 1800's rice plantation located on the Waccamaw River, which joins with the channels in Murrells Inlet. Later it became a national wildlife refuge and golf course, which it remains today, blending in with the gated residential golf community that uses the name. The refuge is also an archeological research project for the state's university, and many of the ancient live oak trees that dot the neighborhoods are protected and registered. The Wachesaw Plantation Golf Club was designed by Tom Fazio and includes a pool, tennis courts, and the beautifully landscaped course. Membership is an option though a few of the homes will offer membership with the sale. The homes in Wachesaw were built around 1986, and average from 2 to 5 bedrooms in the price range of $400,000 and up. Most have been updated to include all the expected luxury upgrades. 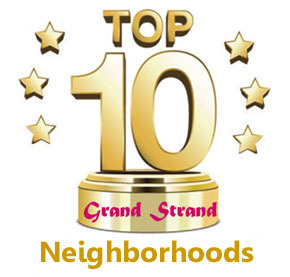 These exclusive homes are very popular and the address is coveted in Murrells Inlet. In 2002, another neighborhood, Wachesaw East, was developed with less expensive homes, modern landscaped streets, a large lake to offer water views, and walking trails for the fitness-minded. These homes are near the original village and have some views of the golf course, but offer a much more affordable price ranging from the high $200,000's to about $400,000 for the largest ones with the best views. Although the amenities are optional and are membership only, they are some of the finest, and keep the HOA fees reasonable. There is also an equestrian center located on the border of the historic village for horse lovers - an unusual attraction. The Wacca Wacca Marina is close for boat lovers and Huntington Beach State Park is not far for fun at the beach. Children attend the Waccamaw Elementary, Middle, and High Schools, which are excellent. If you're looking for a home with character, on a golf course, and with great amenities, start your search with the homes at Wachesaw Plantation and Wachesaw East. Call us for a tour and complete list of the available homes to visit.